Nvidia's GeForce GTX 1080 is real, and it's spectacular. We break down why. 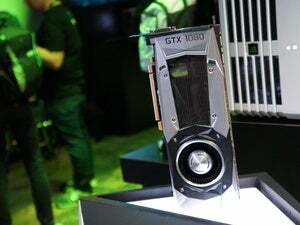 After taking the radical GeForce GTX 1080 graphics card for a spin and poking, prodding, and benchmarking its every nook and cranny, it’s official: This beast is every bit as powerful as Nvidia promised, and easily the new single-GPU graphics card champion, blowing away even the mighty Titan X.
PCWorld’s exhaustive GTX 1080 review covers every aspect of the new card in detail, but not everyone has the time or inclination to read a massive 11-page article chock full of tech specs and performance charts. So we’ve distilled its essence down to a handful of key facts that you need to know about the GeForce GTX 1080 (starting at $599 MSRP, or $699 for an Nvidia Founders Edition). As I said, the Pascal graphics processor in the heart of the GTX 1080 is hands-down the fastest GPU ever to hit the streets. 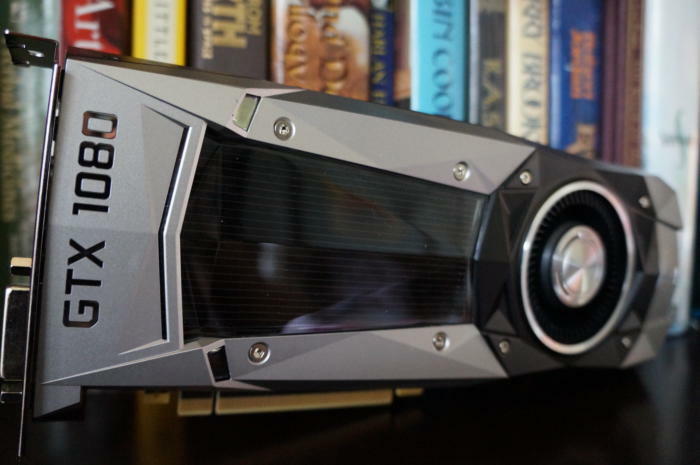 The card’s roughly 70 percent faster than its predecessor, the GTX 980, and 25 to 30 percent faster than the Titan X. That’s crazy. And it overclocks like a champ, which pushes frames to even loftier heights—an overclocked GTX 1080 outpunches a GTX 980 but a staggering 94.5 percent in Rise of the Tomb Raider at 4K resolution and Very High graphics settings. Things get a little more interesting in Ashes of the Singularity, which was an outlier in our performance testing. 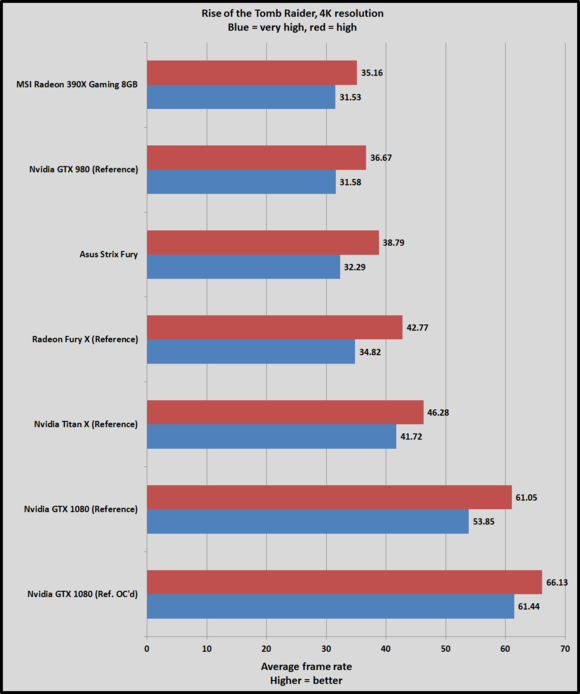 In DirectX 11 mode, the GTX 1080 blows away all comers as expected, but in DirectX 12, the game’s heavy use of asynchronous compute tasks—which AMD Radeon cards use dedicated hardware to process—lets the Fury X get pretty close to the Nvidia card’s baseline stats. 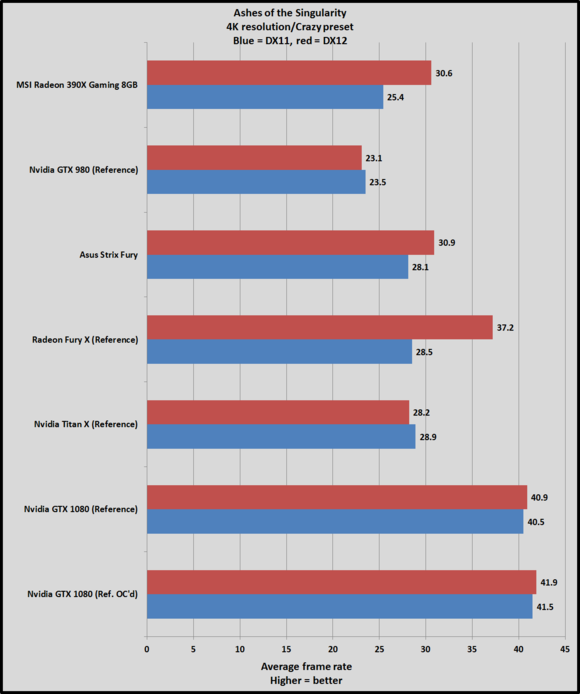 It’s still early days for DirectX 12, however, and the GTX 1080’s Pascal GPU packs enhanced async compute features of its own, which lets it widen the gap a bit at lower graphics settings in AoTS. Bottom line: The GTX 1080 is a powerful option for 1440p and 4K gaming, though vastly overkill for most 1080p setups. Nvidia was able to squeeze so much power out of the GTX 1080 because it’s incredibly energy efficient. 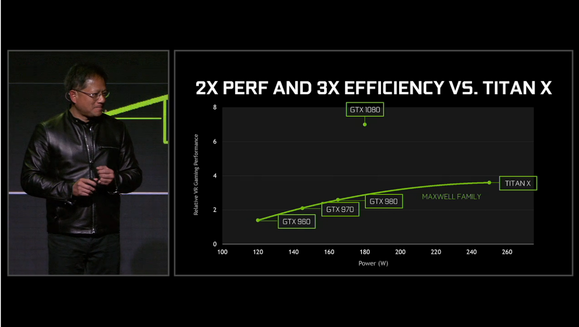 How much so depends on the task at hand, but Nvidia says it can be up to three times as efficient as the Titan X. The move to a 16nm process gives Nvidia's newest GPU an insane jump in performance and efficiency. In fact, the GTX 1080 only sips a mere 180 watts of power over a single 8-pin power connector, which is barely more than the GTX 980’s 165W requirement. That’s nuts, considering the record-breaking performance pumped out by the card—the Titan X eats 250W over 6-pin and 8-pin connectors, while AMD’s Fury X gobbles down 275W over a pair of 8-pin connections. The GTX 1080’s able to hit those lofty power and performance numbers thanks to a massive shift in the underlying GPU technology powering it. Both Nvidia and AMD graphics cards have been stuck on the 28nm manufacturing process for four long years, but the GTX 1080’s Pascal GPU jumps two process generations, all the way down to 16nm transistors. It also embraces performance-enhancing 3D FinFET features that first appeared in Intel’s Ivy Bridge processors, and introduces cutting-edge new GDDR5X memory that runs faster and more efficiently than the GDDR5 memory found in most graphics cards. 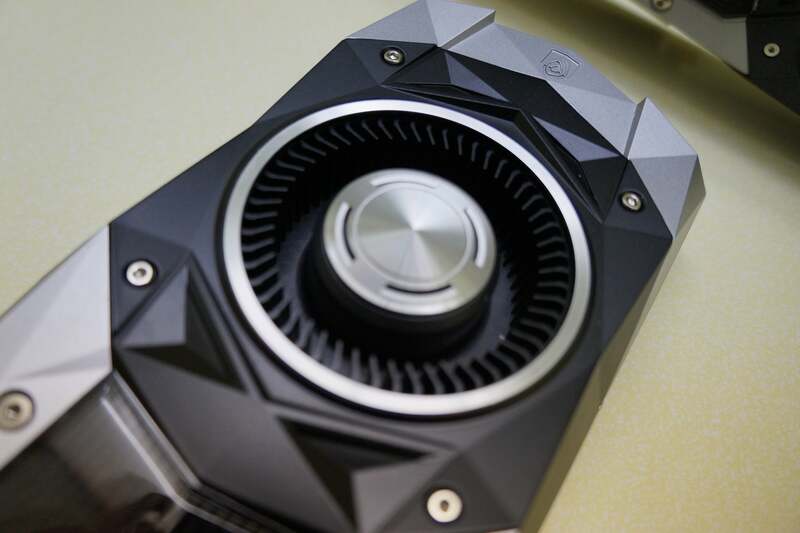 Some enthusiasts were disappointed that the GTX 1080 didn’t feature the revolutionary high-bandwidth memory that debuted in AMD’s Fury series, but first-gen HBM is limited to 4GB capacities, and the next iteration isn’t expected until roughly the end of the year. The GTX 1080 packs in numerous new software features, too. “Simultaneous multi-projection” is the catch-all name for a family of new technologies that improve how images are rendered in multi-monitor setups, boost in-game frame rates by rendering the edges of the screen at lower resolution, and dramatically improve VR rendering efficiency. 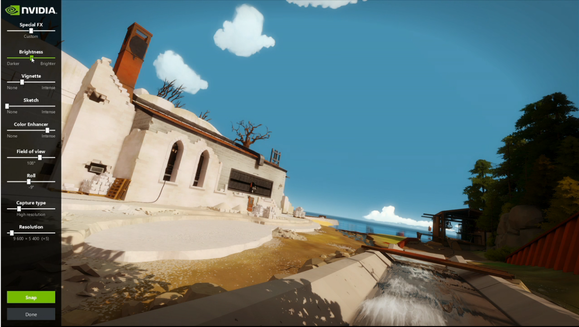 Nvidia's Ansel interface, in The Witness. Ansel is a new “in-game 3D camera system” that lets you pause the game, move the camera around the environment to get the perfect angle, then snap a screenshot that you can enhance with various filters, effects, and high-resolution options. You can also create “360 bubble” screenshots viewable inside VR headsets or Google Cardboad. Fast Sync is designed to work with e-sports games where your GPU’s pumping out hundreds of frames per second, or far higher rates than your monitor support. It basically reduces screen tearing without introducing extra latency, skirting around V-sync’s major performance hindrances. 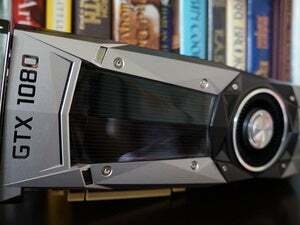 The GTX 1080 also supports HDR and copy-protected 4K streams, and offers a new “GPU Boost 3.0” system that lets overclockers create per-voltage clock frequency increases that match their individual GPU’s capabilities, rather than applying a blanket clock speed increase across the board. While the GTX 1080’s prices will start at $599, the only model guaranteed to be available on the May 27 launch date is Nvidia’s $699 Founders Edition. So what’s a Founders Edition? It’s basically what Nvidia called a reference card in previous graphics card generations. The GTX 1080 Founders Edition sports Nvidia’s premium aluminum shroud and vapor chamber cooling system, but it’s not overclocked, and the GPUs inside aren’t cherry-picked for maximum overclockability, either. The blower-style fan on the GeForce GTX 1080 Founders Edition. Nvidia plans to sell Founders Edition cards for the GTX 1080’s lifetime, which makes system builders like Falcon Northwest and Origin PC happy, as it means they’ll only have to certify a single GTX 1080 model for their systems. The price-to-performance ratio of the Founders Edition probably won’t appeal to consumers like you and I once a wide range of GTX 1080 variants from Nvidia’s partners appear. Yes, the GTX 1080 is the most badass graphics card ever created, and a massive leap over what came before—but don’t buy it yet. The GTX 1070’s release is right around the corner, and AMD’s new Polaris GPU-based Radeon graphics cards—which are also making the jump to 14nm FinFET technology—are rumored to be unveiled at Computex, in the first week of June. The world of graphics cards may look much different in three weeks than it does now, in other words. Put off pulling the purchasing trigger until you see what everybody has up their sleeves. If you want far more details about any of the topics we’ve covered, including many more performance comparison benchmarks, be sure to check out PCWorld’s GeForce GTX 1080 review. You won’t be disappointed.